UCI research team pioneers imaging technique that clearly reveals structure, individual chemical bonds. Overjoyed researcher Chi-lun Chiang of UC Irvine physicist Wilson Ho’s group penned that inscription, complete with 14 exclamation points, in a laboratory notebook at 10:35 p.m. last July 17. He and another doctoral student in the group had rushed from their dorm rooms after seeing an image of the structure of a single molecule appear on their computer screens. They raced to the experiment site in the basement of Reines Hall and confirmed their success. 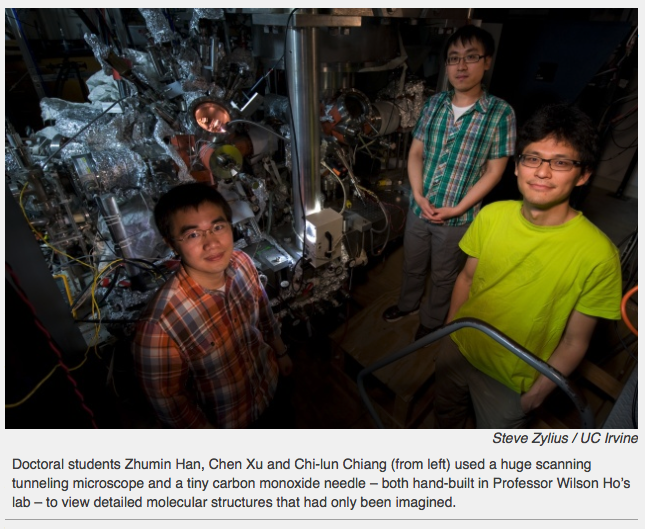 Using a two-story scanning tunneling microscope and a tiny carbon monoxide needle dubbed the “itProbe” (both hand-built on the premises), they’d been able for the first time to clearly reveal the individual chemical bonds in a single molecule by bringing into focus features that are a million times smaller than the width of a human hair. Their results have now been published in the prestigious journal Science, testament to the breakthrough work. For decades, chemists have used ball-and-stick models to represent what they thought the structures of molecules would look like. But the UC Irvine group could see with incredible detail what others had only imagined – the polygons forming a four-petal cobalt phthalocyanine molecule. The researchers have replicated the results repeatedly and reduced the time to capture a single image from about six hours to one. They expect that the same technique will work with other types of molecules too, opening up vivid new views of molecular chemistry. “Shocking!!!!!!!!!!!!! !” Overjoyed researcher Chi-lun Chiang of UC Irvine physicist Wilson Ho’s group penned that inscription, complete with 14 exclamation points, in a laboratory notebook.